One of the wizards of boxing Vasyl Lomachenko leads a trio of the best fighters on the planet headlining separate events this weekend. The other two pound for pound best are female prizefighters. WBA and WBO lightweight titlist Lomachenko (12-1, 9 KOs) meets England’s Anthony Crolla (34-6-3, 13 KOs) on Friday April 12, at the Staples Center in Los Angeles. ESPN+ will stream the Top Rank card live. Six years have elapsed since Ukraine’s Lomachenko made his pro debut after dominating the amateur boxing scene for years. In the half dozen years as a pro the speedy southpaw has evolved into a full-fledged professional fighter. No more slap shots and dosy-does around the ring. Hyperbole comes easy in the boxing promoting world, but in the past two years against elite competition the fighter known as “High Tech” has graduated into another level. Wins over Jorge Linares and Guillermo Rigondeaux have added spit shine luster to a glowing resume. “He’s one of the greatest fighters of his generation,” said Top Rank’s Bob Arum, who’s seen them all for the past 50-plus years in the boxing world. 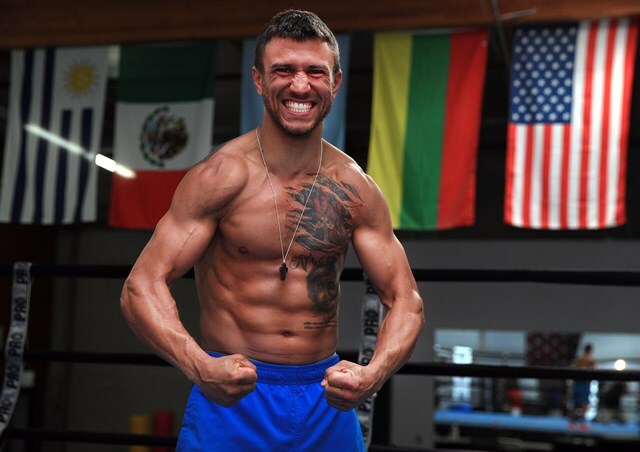 Lomachenko, 31, has acclimated into the hurt game and graduated to a higher form of prizefighting. Fans should expect a high octane performance. Nothing less. Can Crolla force him to another realm? Any time a pound for pound fighter performs is worth watching. Lomachenko definitely belongs in the top 10 in the world. Next up to try and stop the Lomachenko machine is Crolla. Also on the same card is WBO super middleweight titlist Gilberto Ramirez (39-0, 25 KOs) trying out the light heavyweight division against Tommy Karpency (29-6-1, 18 KOs) in a battle of tall southpaws. Lefty versus lefty changes up everything. It’s merely a try out. Ramirez possesses the height at 6’2 and though he seems to have long arms, prefers fighting on the inside Mexican style. “I know Tommy is an experienced guy, but if Bob gives me a big fight with Callum Smith at 168, I can make the weight. That would be a fantastic fight,” said Mexico’s Ramirez, 27. Karpency, 33, stands an inch over 6-feet in height and has fought numerous world champions in the past and has a win over Chad Dawson. “We’re both southpaws, so that makes for a better flow than righty versus lefty. And we’ll see what happens,” said Karpency. Another interesting matchup pits undefeated Arnold Barboza (20-0, 7 KOs) against former world champion Mike Alvarado (40-4, 28 KOs) in a super lightweight clash set for 10 rounds at the Staples Center on Friday. Alvarado hasn’t lost in four years. The ESPN+ broadcast begins at 5 p.m. PT. You couldn’t pick two better names than Shields and Hammer. The pending middleweight unification battle between Claressa Shields (8-0, 2 KOs) and Christina Hammer (24-0, 11 KOs) on Saturday April 13, at the Boardwalk Hall in Atlantic City, between two pound-for-pound combatants who are both undefeated in the female fight world has never happened before with women. It’s almost happened before, but didn’t. Years ago Laila Ali and Ann Wolfe were in a similar position but despite the clamor and hoopla the two female middleweights never met in the boxing ring. It remains one of the travesties of female boxing history. Today, we have America’s Shields with her two Olympic gold medals draped over her shoulders and attacking the female pro fight world like a speeding bullet. She’s ripped through every opponent put in front of her and shredded them with nary a blip. Except against Costa Rica’s Hanna Gabriels who managed to knock down Shields but was henceforth dominated. In the other corner we have Hammer a tall blue-eyed prizefighter from Germany, home to many excellent female boxers in the past 25 years. The 28-year-old boxer/puncher with a rifle jab has never been defeated in 24 pro fights despite fighting for nearly a decade. She’s a very strong fighter who prefers to fight on the outside so she can batter opponents with her jabs. She also wields a strong right cross. It’s Shields speed and agility versus Hammer’s long stiff jabs. Can Shields get on the inside where she can unleash those blazing combinations? Or will Hammer wrap her up with her holding tactics that rendered Kali Reis helpless when they fought twice. Hammer’s jab is relentless. They’re both primed for the fight of their life. Hammer is equally aware of the spotlight. “I want to show that I’m the undisputed champion. I’m the longtime champion and I’m going to let the people see that women’s boxing is exciting just like the men. This is a great match to show that,” said Hammer, 28. All of the belts will be the prize including WBA, WBC, WBO and IBF titles. Showtime will televise this historic moment beginning at 6 p.m.
Top Rank’s Arum said he admires the tournament exhibiting the best super lightweights in the world. He has a couple of his own and is willing to put his guys against the winner of that tournament. One is Teofimo Lopez, 21, their undefeated lightweight at the moment, who is not shy about fighting world champions now. Arum said a possible match between Lopez and IBF lightweight titlist Richard Commey is an immediate possibility for the Brooklyn-based fighter. “We can’t keep him trotting, he wants to run,” said Arum about Lopez, adding that he foresees him moving up in weight to challenge the super lightweights.